Love the idea of fresh pizzas in a traditional oven but would rather not have to cook outside? Maybe you are low on space, or the price tag of your dream appliance is going to take a while to reach. A pizza maker such as this Giles & Posner model is the perfect answer to all of those issues. 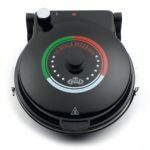 It works like a panini or waffle maker, simply sitting on top of your kitchen counter but still giving great results, in the comfort of your own home. It is small in size, with a surprisingly snappy cooking speed that ordinary oven appliances can’t compete with thanks to the smart heating technology. It still has a lot of the features of a large outdoor oven, including the removable pizza stone. However, the temperature is easier to control with five settings to choose from, and you don’t need to mess around with adding fuel as it is electrical. There is also no smoke produced, which is great if that is something which puts you off. The hot stone plate removes excess moisture from the pizza base, resulting in a crispy texture which is not far off that which can often only be achieved with top-of-the-range models. 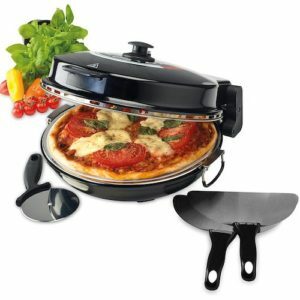 It comes with a pizza cutter and peel, so you are ready to go as soon as it arrives and can emulate a real pizza chef. The 1200W power can get your food ready in around five minutes, reaching a temperature of 390°C. A power light lets you know when it is ready to go, no matter what heat setting you need. It isn’t as technical or advanced as an outdoor clay or stainless steel model, but it is fun and handy for those nights you want fresh pizza without hassle. It is also a lot safer if the kids always want to get involved. The big positive about it being suitable for indoors, though, is that you can have fresh pizza all year round, no matter what the weather is like outdoors.